Country living on five roomy acres, coupled with a vacation rental home that is roomy, comfortable, and incredibly well appointed is waiting for you and your family and friends for your next vacation. Come to Coeur d'Alene and experience the very best of what Idaho has to offer. This luxurious vacation rental home is perfect for a small group to just relax and play or to just enjoy the peace and quiet of the acreage. Regardless of your interests, this home is sure to please! Outside, you'll find all the room you need to bring your ATVs or mountain bikes and just enjoy all the room you'll have. Closer to home, relax on the large deck after an active day of play on the water or the nearby biking trails or close ski resorts. Spend time barbecuing with your family and friends while sipping on your favorite beverage. Sunsets are absolutely spectacular in this piece of northern Idaho paradise. Summer time in the Coeur d'Alene is a vacationer's paradise. The Ironman races are in June, Fourth of July celebrations are amazingly beautiful and over Labor Day weekend you'll find the hydroplane races which is a huge draw to the area. All of these activities are in your back yard but you'll also have all the peace and quiet you desire in a vacation home at this amazing property. Inside this custom 2500 sq. ft. vacation rental home, you'll find a huge open main floor with the kitchen, dining area, and living room all open to each, making it the perfect spot to prepare all your meals while visiting with your group. A large living room has enough room for everyone to visit or to sit by the fireplace and watch TV or a movie. If there are any musicians in the group, you're sure to enjoy the grand piano! Bring the dogs with you and let them roam in the fenced dog run outside. Dogs are welcome for an additional nightly fee. There are three large bedrooms and two bathrooms to accommodate up to eight guests (six adults). The master suite has a full-size bed and its own master bath complete with large soaking tub perfect for relaxing after a long day of work or play. The other bedrooms are equally comfortable with full beds and room for everyone to get ready for a day of activities or to relax before going to sleep. There's an additional sleeper sofa in the living room for extra accommodations. Should you need to do a load of laundry you'll also find a full size washer and dryer. This elegant vacation rental home is situated in the heart of Coeur d'Alene, close to theaters, shopping, and several dining options. You're only a few minutes drive to downtown Coeur d'Alene, famous for its shops, art walks, and the famous Coeur d'Alene resort with one of the most beautiful golf courses in the country. If you like hiking or bike riding, you've hit the jackpot. You're only a few minutes from the famous green belt. There's a boat ramp close by at Kidd Island. If bike riding is your thing, the green belt is close by and the world famous Centennial and Hiawatha Trails are just a short drive away and offers an uninterrupted bike ride so you can enjoy some incredible scenery. There is a bus that will take you back to your car too! If you like to ski, you're within an hour's drive to several ski resorts like Schweitzer, Silver Mtn. or Lookout. This is the perfect home for your vacation, whatever your plans hold. The setting is amazing, no matter what your interests are. Whether it be peace and quiet or spending your time on the water and taking in the life of world famous Coeur d'Alene. Make the call now and reserve this gorgeous vacation rental home on incredible acreage for your very own. You won't be disappointed. Very nice home, especially if your musically minded. My kids enjoyed the piano and the copious books of music and opera references. Neighbors dog were very friendly and met us on our porch on more than one morning. Kids liked the playmates. For the most part the home in the country was nice. We went to Coeur d'Alene to do some biking and would have liked to be closer to the biking trails. The home could use a little TLC along with major yard work. 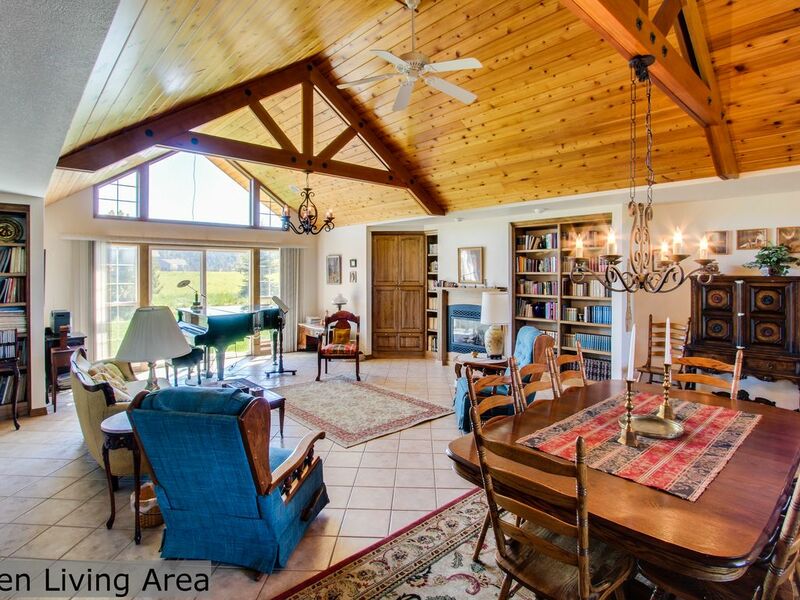 This house is in a beautiful country setting but yet only a few miles from Coeur d’Alene! Location is good. Home was clean and had lots of room. However, the furniture was dated and the yard and surrounding area looks nothing like the photos. Grass was dead and the yard around the home was over grown. We appreciate receiving this feedback and having the opportunity to respond to it. A lot of the furniture in the home is antique and will be staying in place. The sprinkler system is getting repaired so we can better care for the lawn. Thank you!